The Spitfire was the RAF's first all metal stressed skin single engine fighter. It was produced from 1938-47 serving throughout WW2 and on into the 1950s in a series of increasingly capable versions. Over 40 examples are still airworthy world wide. The Mk.IX was produced to counter the FW190. As a matter of urgency the basic Mk.Vc airframe was married to the new Merlin 61 with a 2 speed supercharger. 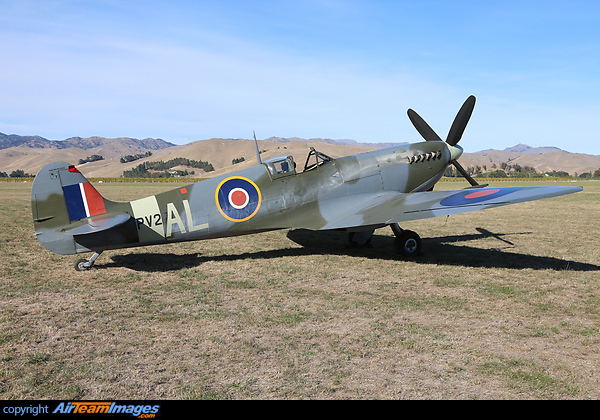 For many the Mk.IX was the definitive Spitfire, and was produced in the greatest number. 1 x Rolls Royce Merlin (880 - 1315 hp) piston engine. The Mk.IX used the Merlin 60 series rated at around 1700hp. 2x 20mm Hispano canon and 2x .5 inch machine guns plus 1x 500lb and 2x 250lb bombs.